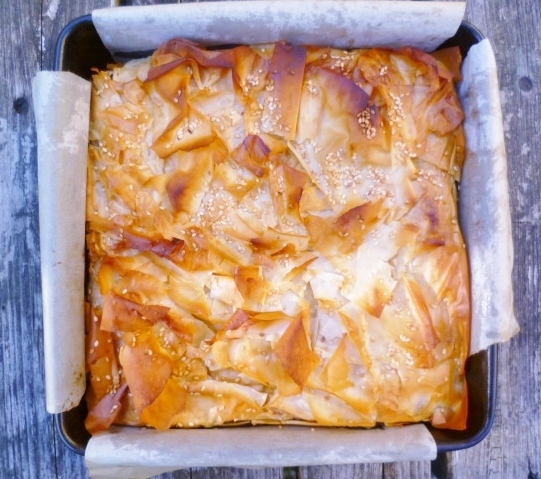 One of my absolute favourite things to bring to a picnic, or indeed any party, is spanakopita, a cheese and herb filo pie (or little triangles) from Greece and popular in many forms around the Mediterranean and Middle East. Recently I was asked about how I made my spanakopita and to be honest I hadn't really thought about it. This is something that even with my cack-handed baking skills I can whip up quickly - filo pastry, butter, egg feta cheese, onion, garlic, spinach and perhaps a few herbs. I have been making this for so many years now I have no idea where I got the original recipe. Which led to question whether or not I was actually making it correctly or what I really mean, authentically?) I was browsing through Yotam Ottolenghi and Sami Tamimi's sublime Jerusalem, a book chock-full of fabulous recipes from the eponymous Jerusalem, that reflect the city's complex history and cultural roots, with culinary influences which encompass its Muslim, Jewish, Arab, Christian and Armenian communities and influenced by the great Mediterranean climate and gorgeous ingredients. 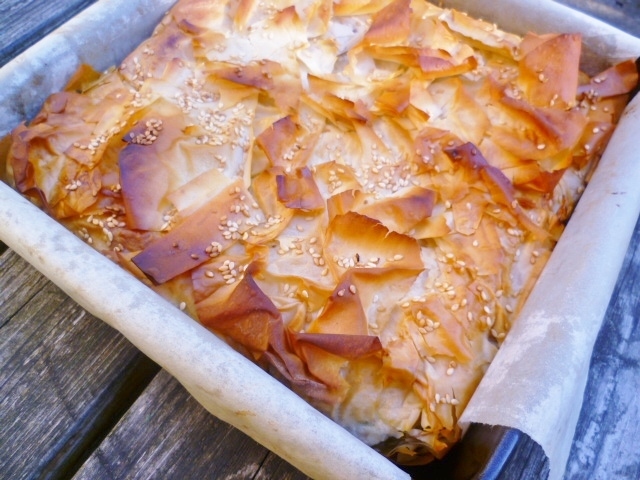 One recipe, of many, that caught my eye was for Herb Pie, which essentially was a large spanakopita pie. Yotam Ottolenghi talks about "The extravagant use of herbs in our cooking is definitely to be blamed on Jerusalem. Herbs are sold there by the bucket load. Palestinian peasant women come into the city with baskets brimming with fresh produce from the countryside to sell on the kerbside." It is a wonderful, if dusty, image! Since Yotam Ottolenghi's Herb Pie also included chopped celery, chard, dill, lemon, mint, parsley, rocket and spring onions as well as spinach, I had to give this a try. It made me think of traditional British potherbs - the old-fashioned name for leafy green vegetables such as chard and spinach, essentially any plant whose leaves, stems, or flowers are cooked and eaten or used as seasoning, which would have been typically found in an old kitchen garden or in parts by the kitchen door. Yotam Ottolenghi's Herb Pie also uses anari, a Cypriot cheese, rather than the more familiar feta cheese. There are lots of Turkish and Cypriot shops near where I live in north London. A comparative recent discovery is cans of cheese. Yes, you heard correctly - a can of cheese. This is beyaz peynir (which in Turkish means white cheese); a salty, dense cheese made from unpasteurized sheep milk, very similar in taste and texture to Greek feta cheese. Actually I would defy you to tell the difference. Perhaps feta is a little more tangy and beyaz peynir is a little creamy. Needless to say I love the stuff. The cans often carry two rounds of cheese in brine, a definite bargain for the thrifty, such as me, who like to cook and entertain. This cheese, so similar to feta, works brilliantly in a whole host of different dishes from salads to mezze. 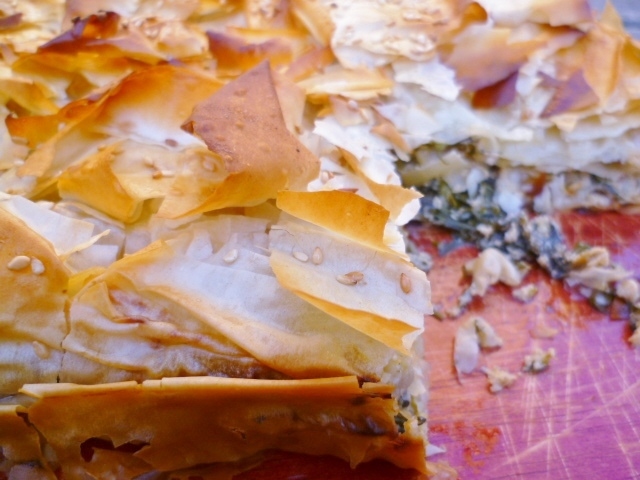 It can be stuffed in borek (little mouthfuls of cheese with either spinach or honey and nuts) or in pie with filo pastry. It is fabulous in a grilled sandwich with say courgettes and herbs and really good roasted with vegetables such as peppers or tomatoes with olive oil. It was a wonderful pie, eaten hot and delicious cold - perfect all year around whatever the weather; a perfect meal for vegetarians and meat eaters alike. Now since this a particularly frugal meal (I only had to buy cheese and filo), I am entering it into this month's Credit Crunch Munch challenge from Helen at Fuss Free Flavours and Camilla at Fab Food for All, which this month is hosted by Anneli of Delicieux. And this is a twofer recipe posting, as I think it meets all of Anneli's criteria for her new Delicieux Four Seasons Challenge which she has just launched with Lousia at Chez Foti. This month the theme is Picnic Food + Outdoor Nibbles and there are already so many appetising entries. As usual, I am looking forward to seeing what everyone else comes up with - knowing I shall be both full of envy and tummy rumblings! Ha ha, I just posted a Spanakopita, but made mine with just spinach and parsley, not the wonderful and fragrant line up you've used in yours which no doubt tasted spectacular!. And your pics are fab, unlike my incredibly shameful ones. Shall definitely be trying with a few tasty additions that you/Mr Ottolenghi suggest. Thanks so much for your glorious entry to the very first Four Seasons Food challenge! Nearly. We didn't have spanakopita tonight, but it was a distant cousin. Chard, artichoke and feta cheese tart. With LOTS of thyme from the garden. With bulgar wheat salad and the (probably) last asparagus of the season. Cheese in a can?!! Well I never! Sounds most interesting indeed. Lovely pie packed full of wonderful greens and herbs. Thanks for entering Four Seasons Food & Credit Crunch Munch! where the wild things are . . .